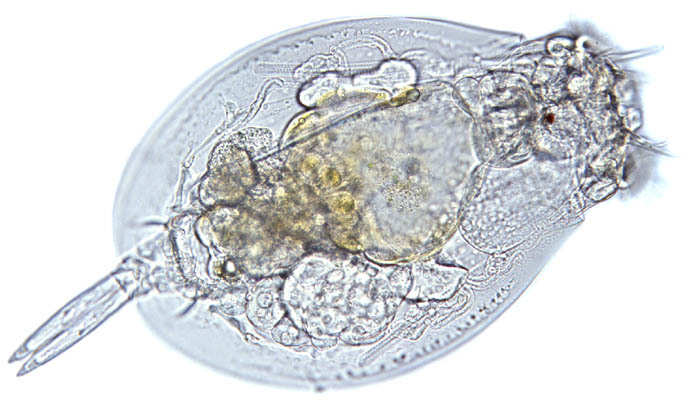 This photograph of the rotifer Euchlanis shows all the internal organs. On the sides a pair of bundled long muscles are just visible. The rotifer uses these to contract the ciliated crown. The wavy tubes alongside are used to get rid of waste products. With beating cilia of so-called 'flame cells' a current is made that drains to a bladder or to the intestines. The bladder in this species is situated near the tail end. The brown region is the stomach. The white structures on each side are gastric glands.